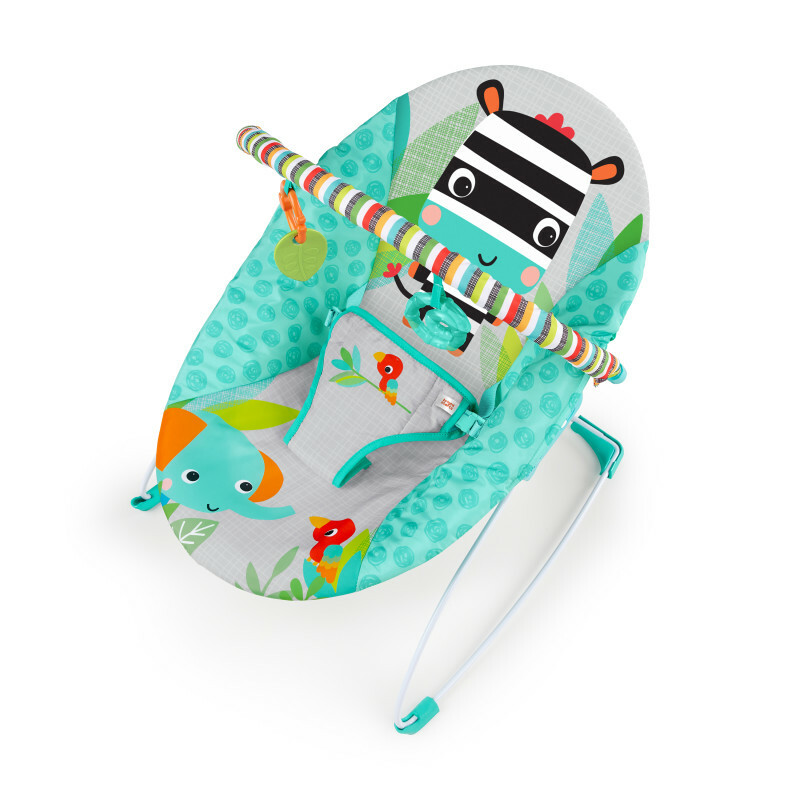 Fun Comes First!™ The Zig Zag Zebra Vibrating Bouncer™ from Bright Starts™ cradles baby in soft fabrics and a cheerful fashion. The charming toy bar is adorned with interactive toys and easily removes with one hand for easy access to baby. The deep cradling seat pampers baby with soft support. With a flip of a switch, soothing vibrations help keep baby happy and content. Baby will be “bouncing” in no-time because no tools are required, making for an easy assembly! Safety-enhanced with an adjustable 3-point harness and non-slip feet. We all know things get a little messy and when they do, simply toss the seat pad in the washing machine and air dry. Ideal for babies up to 6 months (20 lbs). Only 1 “C” battery is required to start up the fun (not included). Seat pad – Remove from frame. Fasten buckles on seat restraint and seat pad. Fasten all hookand- loop patches to the corresponding patch. Machine wash with cold water, gentle cycle. No bleach. Tumble dry, using low heat.Toy bar and toys – Wipe clean with a damp cloth and mild soap. Air dry. Do not immerse in waterFrame – Wipe the metal frame with soft, clean cloth and mild soap.